Now that Apple has officially announced a launch date for Apple Watch, some companies are saying that they will be releasing an app for the timepiece. On Monday, Evernote said it was going to have an Apple Watch app. Now, travel site Expedia announced that it too will have an app available for Apple's timepiece. Expedia says that its app will be ready to go on April 24th, the date that the wearable will be released. According to Expedia, the app will send you notifications about gate changes for your flight, or if there is a delay. Expedia Glance will let you see all your important information at a (ahem) glance. Swipe up from the bottom of the watch dial and scroll left or right to see your Expedia Glance. There you will find the most important and relevant info such as hotel check-in and check-out times, and you can also find out if your room is ready to be occupied. 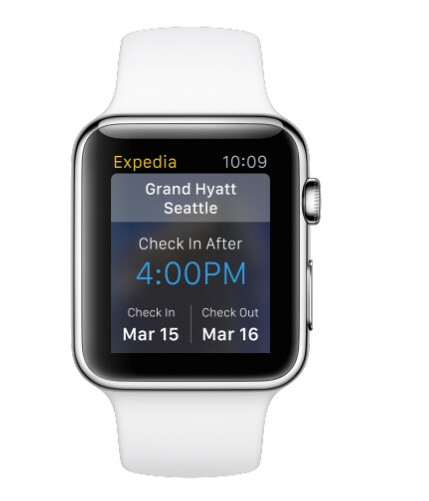 In addition, the Expedia app on Apple Watch will show you your itineraries for upcoming trips. You can also see detailed information such as flight numbers, departure and arrival times, gate numbers and terminals. Hotel information includes maps, directions and phone numbers.